Hey everyone! Today I’m going to share with you some hopefully helpful tips on what to know when buying laminate flooring. 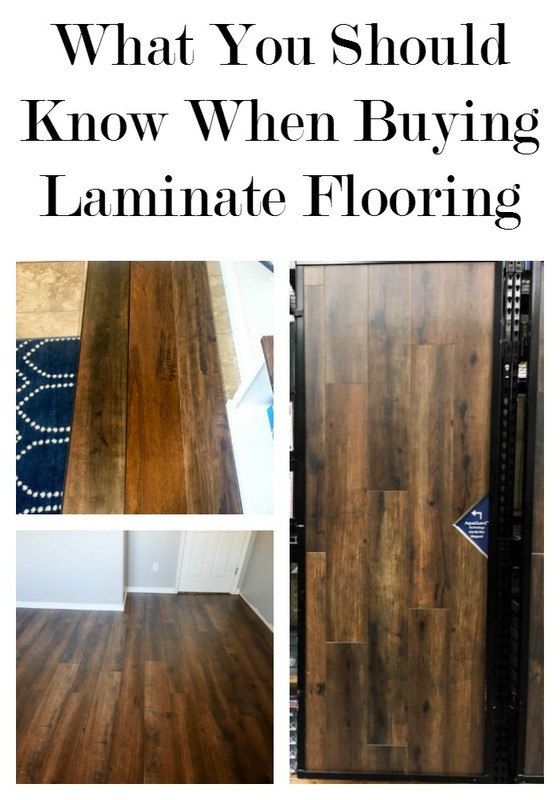 I’m partnering with Floor & Decor to bring you this post and share what I learned when we purchased laminate for our home earlier this year. If you remember, I began remodeling my office back in February. We painted the walls, ripped out the carpet and installed laminate flooring, and built a Murphy Bed/desk unit. It was a big undertaking and one of the most stressful parts was choosing the flooring. 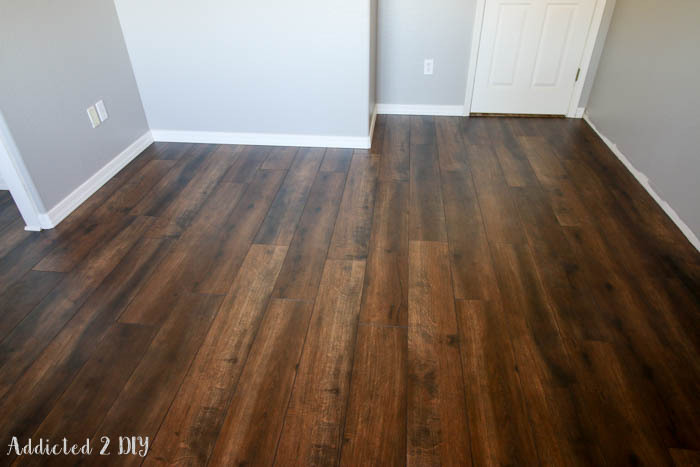 Partly because choosing the perfect style of flooring is a big decision, but also because I had ZERO clue what to look for in laminate flooring. When he found out we were in the market for flooring, my brother-in-law suggested we go to Floor & Decor to check out their selection. 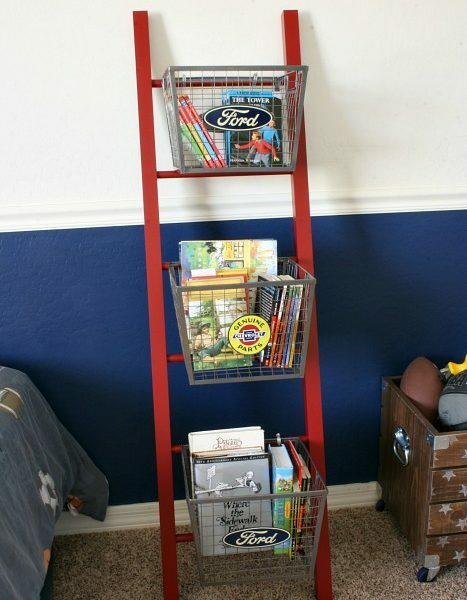 We were instantly blown away when we walked in the door. Every type of flooring option you can think of is there and in stock! We had to put on the blinders so we didn’t get too distracted and headed straight to the laminate section of the store. Even that was a hard choice. I’d never seen so many different options, and I was in heaven! We walked around the store for a bit narrowing down our favorites to a handful of laminate styles. Then it came time to choose the best option for our home. Thankfully, their helpful associates were there to answer all of our questions and we learned a TON that day. Since I know we can’t be the only people who don’t know what an AC rating is or how to choose the proper underlayment, I thought I’d share some handy tips we learned that day. The biggest thing you want to take into consideration when choosing any type of flooring is your budget. You may fall in love with a certain type of flooring, but if you need your whole house done and your budget would only buy that flooring for one room, you might want to consider other options. What I love about Floor & Decor is that we are able to clearly see what the price is for each type of flooring. That helped us a ton when it came to picking a handful of favorites. We also didn’t have to compromise durability to get a lower price. 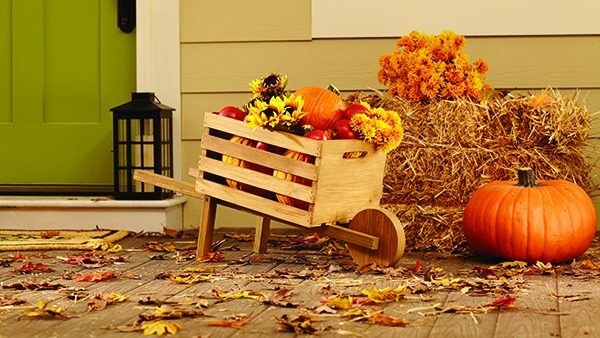 Floor & Decor offers unbeatable prices that makes it easy to stay within budget. The next thing you want to consider is the foot traffic your flooring will be getting. You want to get the highest rated laminate for your budget. This is where that AC rating comes in. This rating tells you how durable your flooring will be. 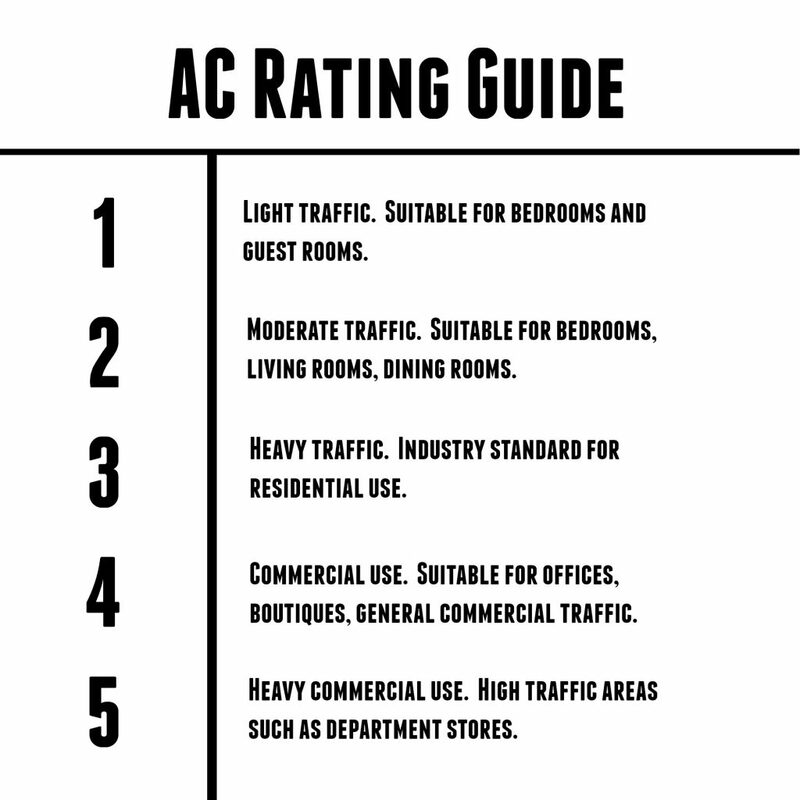 An AC rating of 3 is the industry standard for residential use. 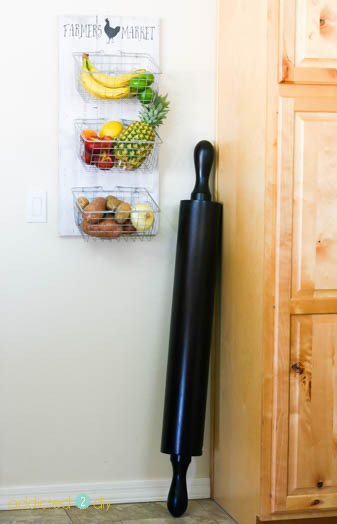 This means it’s suitable for any area in your home (living area, bedrooms, kitchens, etc.). An AC rating of a 4 or a 5 means you’re getting even greater, commercial-grade durability. With us having two young boys and two gigantic dogs, we knew we wanted the highest rating our budget would allow. When taking into account your budget and durability, the hardest part then becomes choosing the style of flooring you want. One of my favorite things about shopping for laminate at Floor & Decor is that they have huge displays of every type of laminate so you can really see the big picture. Not just a tiny little swatch. You can also purchase full size samples of the flooring for $5 each to see how it would look in your home. I highly recommend this so you can see how the flooring looks in your home during the day and night. Since the flooring would be going up against our existing tile, I wanted to make sure it didn’t clash. Once I narrowed down my favorites, I then opened up the photos on my phone that I had taken that day of the large displays so I could make my final decision. While an underlayment is not always required, it is recommended when installing laminate. There are various types of underlayments and Floor & Decor helps you make the best choice by providing a handy sound test station. 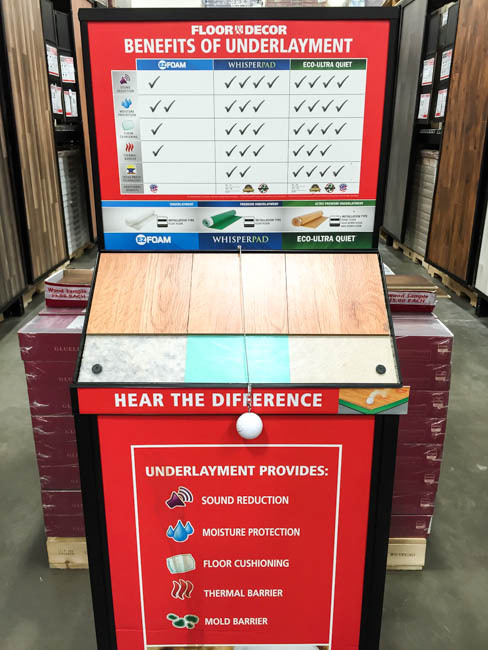 You can listen to how the flooring would sound by dropping the golf ball onto each of the samples and hearing the difference. Because of this, we chose the Eco Ultra-Quiet underlayment. It is easy to install, super quiet, and includes a moisture barrier. Laminate comes in various thicknesses and you want to be sure you make note of the thickness when you pick a favorite style. If you’re replacing all of the flooring in your home, it isn’t really an issue, but if you are joining up to existing tile or carpet, you want to make sure you have the proper threshold moulding. Floor & Decor sells threshold moulding in tons of colors to match your laminate choice. Some are flat for laminate that will meet up flush with the existing flooring and some are angled in case your tile or laminate sits higher than the adjoining flooring. Any time you’re purchasing materials for a project, you want to give yourself a little wiggle room. Typically this means you want to purchase an additional 10% of materials. This allows you to have enough extra for cuts that need to be made and any mistakes that may happen. With my office, we ended up with only 1 or 2 planks of laminate leftover when we were finished. When we bought the flooring for our office, we took all of these tips into consideration when making our choice. We ended up purchasing Aquaguard laminate flooring in Coco. I love the color and we get TONS of compliments on it. We chose it for it’s durability, but also because it is water-resistant. At the time, our younger dog was still just a tiny puppy, so the water resistance gave me peace of mind. Our plan is to soon replace the rest of the carpet in the house with this same flooring, which is even easier to do now that the price has gone down since we originally purchased it! How can you not love that!? 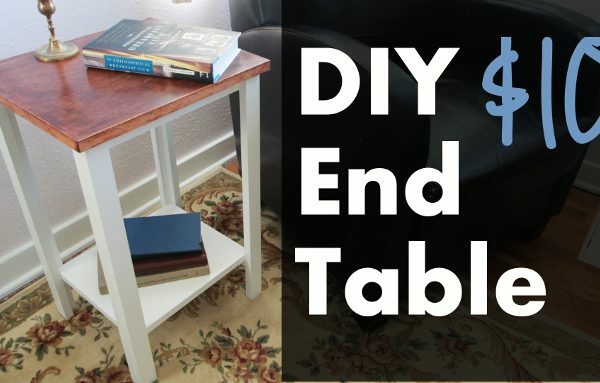 Hopefully these tips will save you some time if you’re ever in the market for laminate. It’s definitely good information to know and something you can then share with others when they ask. DISCLOSURE: This post was sponsored by Floor & Decor. All opinions and ideas are 100% my own. One other consideration–the “click” together laminates go down easily and don’t require nails, glue, etc since they are floating. I installed ours on the best underlayment and it really looks good. However, tuypically every step yields a cracking sound from the movement of the laminate! This is not a subfloor issue (i.e., unlevel) but rather is a result of the “give” from the pad/underlayment. The house looks better with the flooring but the creaking/cracking noise can be annoying. That’s interesting. Mine doesn’t creak or crack at all.